Both have powerful motors which oscillate at a very fast speed – making it easy to go through a thick beard. Both Braun series 9 and Panasonic Arc5 are premium shavers featuring various shaving modes a user can select to get a custom shave. Braun series 9 and Panasonic Arc5 feature pivoting / flexible shaving heads able to follow your facial contours ensuring you get a uniform close shave and also make it easier for you to shave all those hard-to-shave areas like the neck & below the chin. If you can’t afford Braun Series 9-9095cc / Panasonic ES-LV95-S Arc5, I suggest you opt for Braun Series 7 790cc. So far it is the top rated electric dry shaver on the market. It can be used while in the shower (though you can’t use it with shaving cream). This 100% water proof shaver features a smooth foil which is friendly to sensitive skins. You will get a clean close shave without any skin irritations. (1) Wet & Dry shaver – so you can choose between those two shaving options basing on your skin type, (2) Good on heavy beards, (3) 5 shaving element – where each element is designed for a specific hair type & skin type, (4) Various shaving modes (each catering to your needs – for example, the turbo mode is ideal for quick shaves & very thick beard yet the sensitive mode is ideal for sensitive skins), (5) Offers you with a close, clean shave, (6) Spare parts are available online, (7) Cleaning station makes it easy to clean the shaver after wet shaving with gel/cream, (8) Good ergonomic shape & rubberized handle makes it easy to hold the shaver for long, (9) 100% waterproof – so you can shave in the shower without worrying about running your shave (it can also be cleaned via running tap water), (10) Flexible 10 D contouring shaving head – follows your facial contours guarantying you with a uniform close shave. OTHER BRAUN SERIES 9 MODELS:- You might also have interest in looking at other top of the range Braun series 9 models. These include (1) Braun Series 9- 9290CC Wet & Dry – this one is slightly different from Braun series 9-9050cc. It is very good on sensitive skins and quite affordable. (2) Braun Series 9 9090cc Dry shaver – Dry only shaver for men with normal skins (not for sensitive skins). If you have been using Braun series 7-790cc and you want to upgrade, this is the best dry series 9 to opt for. 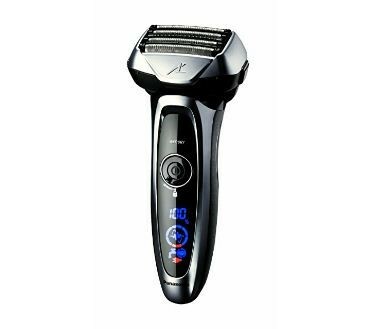 2nd Editors Choice – Panasonic ES-LV95-S Arc5 Electric Razor, 5-Blade shaver – Check price on Amazon – Best of Panasonic – PROS – (1) Excellent performance, (2) Wet & Dry shaving, (3) Great at shaving thick beards, (4) Can be used to shave head, (5) Wide shaving head covers a large surface area thus offer you with a quick shave, (6) 5 Arc sharp blades won’t miss even the shortest hair, (7) Flexible shaving head – pivots to many directions and is able to follow your facial contours (the head rotates in 360 degrees – more flexible than Braun shavers), (8) Convenient to use, (9) Easy to Clean, (10) High speed cutting cycles (14,000 cuts per minutes) more than those of Braun Series 7 but equivalent to those of Braun Series 9, (11) Head lock allows you to lock the shaver’s head to specific angle. Best Norelco Shaver – Philips Norelco Electric Shaver 9700, S9721/84 – Check price on Amazon – (1) All shaving heads moves in 8 directions for an extremely close shave, (2) Wet & Dry shaving system – choose between wet/dry, (3) The shaver can cut even the shortest stubble (of 1-3 days old), (4) You can as well choose speed settings basing on your beard density & skin sensitivity – For example: Slow speed (skin-friendly shave), Medium speed ( thorough shave), and Fast speed (high-powered shave), (5) Makes less noise, (6) Ergonomic handle makes it easy to hold and use, (7) The SmartClean system makes it easy to maintain & clean the shaver – on the other you can as well clean it via running tap water, (8) The Digital Interface lights up when the batter level is low or when the shaver needs head replacement. (9) The V-Track Precision Blades PRO cuts 30% closer than most rotary shavers – the blade self-sharpen themselves so you don’t have to worry about sharpening blades. (10) Contour Detect Technology – the shavers head will follow your facial contours thus offer you with a clean, uniform & close shave. CAN WOMEN USE THESE ELECTRIC SHAVERS OR THEY ARE FOR MEN ONLY? Yes, a woman can use any of these 5 best electric shavers to shave their legs, under-arm and other parts of the body. Most electric shavers for women don’t come with high-end features like those for men. That is to why I compiled this list to help both Men & Women searching for the right eclectic razor to keep their skins hair free. If you have a sensitive skin, I suggest you apply shaving cream a few minutes before shaving – Doing this will soften hair follicles thus make it easier to shave. Electric shavers vary in type but they have similar features which make them high end grooming tools. The more features an electric razor has, the more expensive it becomes. However, even those with a few essential features can provide you with good results. We have two types of electric shavers and these include; (1) Foil shavers (2) Rotary Shavers. Blades are responsible for removing hair from your face / body. Foil shavers like ”Braun Series 9” feature straight blades placed under a very thin foil which separates hair from the skin to prevent cuts & nicks. Foil shaver are very good for sensitive skins but they come at a price. On the other hand, Rotary shavers like Norelco 7500 use circular blades which shave in a circular motion. All electric shavers are classified into two types, (1) Dry only electric shaver (2) Wet & Dry electric shavers. Dry models like Braun Series 7-790cc are ideal for non sensitive skins. You can use them to shave facial hair, underarm hair, chest hair and so much more. Some dry shavers are 100% waterproof so you can use them while in the shower but you can use them with shaving cream. On the other hand, Wet & Dry electric shavers like Philips Norelco 7500 are customized for both sensitive and non sensitive skins. You can apply shaving cream on your hair a few minutes before shaving – this will soften your hair thus make it easier to shave in just one pass. All premium electric razors feature a pop-up trimmer at the back of the shaver. The main purpose of this trimmer is to shape and groom your sideburns & mustache (That is if you have them). Majority of electric razors on the market are cordless. So they come with a charger which you can use to power-up batteries. These rechargeable batteries can’t be replaced once they die but they last for long. A good shaver will hold battery charge for 50 – 60 minutes. Shaving Elements:- Braun series 9 features 4 cutting elements accompanied with 1 SkinGuard – these work together to offer you with a clean close shave. The shaver’s cutting system captures more hair in one stroke in just a few strokes without irritating your skin. Autosense Technology: – The intelligent sonic & Autosense Technology help the shaver adjust its power according to beard density and thickness without pulling or cutting your skin. The shaver is able to cut any type of beard. Contour Flex Head:- Braun series 9’s 10-contour adaptation shaving head will follow your facial contours and offer you with a clean uniform close shave. The head can rotate in 10 directions making it easier to shave under the chin & neck. Skin Guard:- The main purpose of a Skin Guard Opti foil is to protect the skin in every stroke made when shaving. So those with very sensitive skins – feel free to use Braun Series 9. Wet&Dry Shave:- Since not everyone does well with dry shaving. Braun series 9 gives an option to either wet / dry shave. Those with sensitive skins, you can apply shaving cream to soften your beards thus making easy to shave. Cleaning Center: – This is an accessory which comes with the shaver. Its main purpose is to clean and renew the shaver so that every time you use it – it feels new. Smart pop-up trimmer for sideburns & mustache. 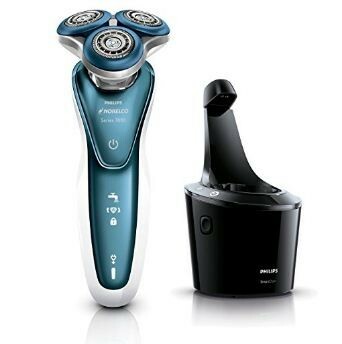 Shave Sensor Technology:- Just like Braun Series 9 – also Panasonic Arc5 features a Shave Sensor Technology which automatically detects a difference in beard density and adjust the shaver’s power so that it smoothly passes through the beard / hair. Arc5 Shaving System:- Unlike other foil shavers on this list, Panasonic Arc5 features 5 ultra-sharp, ultra-thin Nanotech blades – all honed to an acute 30° cutting edge – able to cut both short and long hairs without nicking your skin. If you use this Panasonic shaver, you won’t go back to Norelco shavers because it shaves very close and it does not cause skin irritations. Wet/Dry Convenience:- The Wet & Dry option gives you the freedom to choose what to use basing on your beard type. You easily have a quick dry shave early in the morning / or have a full wet shave after work. You can shave in the shower or over the sink using your favorite Panasonic Arc5 shaver. Motor Speed: – You don’t want to burn up time early in the morning simply because you have to shave. 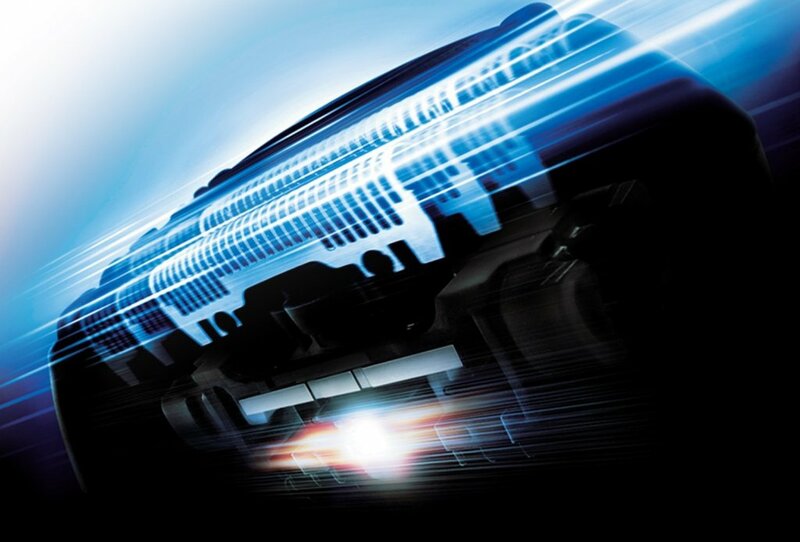 Panasonic Arc5 has a high peak up speed and its motor makes 14,000 cycles per minute – better than Braun Series 7-790cc. If you have a thick beard, worry no more because Panasonic Arc5 can give you a clean close shave in just one pass. Pivoting Head Type:- The multi-flex pivoting shaving head is able to rotate to many directions thus making it very easy to shave all hard-to-reach areas like below the chin and neck. Cleaning station:- For your electric shaver to remain brand new all the time and effective. You have to clean it every after a single shave. This will ensure no shaving cream; hairs sit in the shaver’s blades. Panasonic Arc5 comes with an automatic cleaning station which uses special lubricants to sanitize blades. 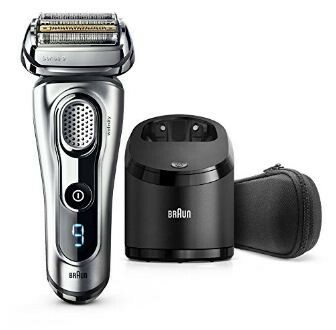 4 shaving elements:- Unlike Braun series 9 which features 5 shaving elements, Braun Series 790cc features only 4 shaving elements – but each element is designed to deal with a specific type of hair. They capture even the shortest hair thus offer you with a clean close shave in just one pass. 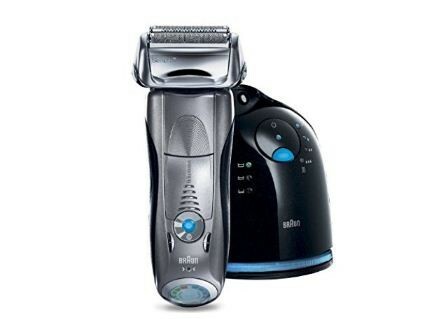 Smart Shaver: – Braun series 7-790cc is a smart shaver. It might be an old model but it was made to serve for centuries. It uses Braun’s sonic technology which reads and adapts to your beard. When the shaver meets a denser spot – it doubles its power to shave that thick beard thus leaving you with a clean close shave. Personalized Shaving: – You have the freedom to choose between 5 shaving modes basing on the type of beard & skin you have. For example; those with very sensitive skins, you can opt for a Sensitive mode (this one uses less power – so your skin won’t be irritated / pulled). On the other hand, those with normal skins, you can opt for a Turbo mode (this one triples the power of the shaver – thus offer you with a clean quick shave. You can easily switch between modes by the push of the button. 8-D contour adaptation:- Series 7 is flexible – its shaving head can rotate / pivot in 8 directions – following your facial contours thus offer you with a clean, uniform close dry shave. When it comes to shaving your neck or below the chin, Series 7 works like a pro in those areas that other shavers find difficulties. 100% waterproof: – All Braun shavers are 100% water proof (up to 5 meters) – so you can use this dry shaver while in the shower and clean it fast using running tap water. 50min cordless shaving:- This is a cordless shaver. It charges fully within 1 hour and you get 50 minutes of cordless shaving once the shaver is fully charged. For those who want quick shaves early the morning, all you have to do is charge the shaver for 15 minutes, this will give you 30 minutes of cordless non –stop shaving. Sensitive skin:- Much as it is a dry only shaver, it can be used on sensitive skins (that is to why it is ranked as the best foil shaver of all time). It has very smooth & thin foils which glide over your skin smoothly – capturing both short and flat-lying hairs for close shaving without irritation your skin. Cleaning Station:- Braun series 7-790cc comes with a cleaning station which you can use to clean and renew your shaver after shaving. The only difference between Braun Series 790cc and Braun Series 7 7865cc is ”Wet & Dry” option. All the other features are the same. You can easily use your favorite shaving cream with this model – this makes Series 7865cc an ideal shaver for individuals with very sensitive skins. Does not shave very close so as to protect your skin from direct contact with blades. Lithium-Ion Battery 50 min. / 1 hr. Comfort Rings: – Norelco 7500 is specifically tailored for men with very sensitive skins. Unlike other Norelco’s this model features Comfort Rings with anti-friction micro-bead coating for a smooth glide. These comfort rings contain 1000s of powder-like beads which make the shaving heads very smooth – so as the shaver glides over your skin – it picks up all short & flat-lying hairs without irritation your skin. You might not get a very close shave as that of a razor (simply because the shaver does not cut too close to prevent skin irritation) – but you will be happy with the final results. Dynamic Flex heads:- You don’t have to twist your head to uncomfortable angles to get a clean uniform shave. Norelco 7500’s shaving heads are flexible – they rotate to 5 directions; following every curve of your face & neck. The ability to follow facial contours makes it easy to shave all hard-to-shave areas. AquaTec technology:- You don’t have to twist your head to uncomfortable angles to get a clean uniform shave. Norelco 7500’s shaving heads are flexible – they rotate to 5 directions; following every curve of your face & neck. The ability to follow facial contours makes it easy to shave all hard-to-shave areas. Gentle Precision Blade System: – Gentle Precision Blade System:- Norelco 7500 uses the latest GentlePrecision Blades which cut both short & flat-lying hairs – even a 1 day stubble. But as the shaver is cutting very short hair, it will also be protecting your skin. Keep it clean:- A good electric shaver will cost you more than $100 – so you don’t want to dish away that money by not taking care of your electric razor after shaving. Always wash your shave with running tap water & a brush to ensure that no hair / shaving cream is left on the blades. Leave the shave to dry in open space before putting it in its storage. Keep it fully charged: – Since you can’t replace your shaver’s battery once it dies, I advise you to always charge your shaver fully to avoid endless / non-stop quick charges that might destroy the battery and shorten on your shaver’s lifespan. Replace blades:- The average life span of an electric shaver’s blades is 1 year. As time goes on, the blades lose their sharpness. You can buy these blades from Amazon.